About 62% of Americans have less than $1,000 in their savings accounts, and one in every three Americans has saved $0 for retirement. One of the main culprits behind our inability to save is debt. Whether it's in the form of student loans, credit card balances, or home lines of equity, debt can snowball into a problem too big to handle on your own. Fortunately, credit counselors can be of help when you have trouble navigating the depths of debt yourself. 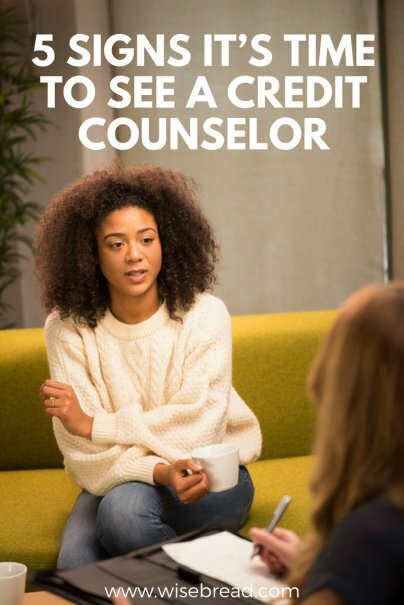 Here are five warning signs that you might need a credit counselor, what will a counselor do for you, and how to choose one. Here are the telltale signs that you have taken on more debt than you can handle. Paying a high APR on your credit card debt is bad. Paying a higher APR and a penalty fee many times out of the year is even worse. When you make a late payment in 2016, credit card issuers can charge you $27 for the first late payment and up to $37 for subsequent lapses within six months of the first one. Falling 60 days behind a payment would worsen your chances of paying back your credit card debt: A survey of 100 major U.S. credit cards found that the average APR for those falling 60 days behind payments was over 28% in recent years. Assuming that you have a card with a balance of $3,000 and a regular APR of 14.99%, you would pay an extra $403.80 in interest in a year with the higher 28.45% APR. Not too mention that making too many late payments also wreaks havoc on your credit rating as your payment history accounts for 35% of your credit score. Consider this example: If you were to put away $400 every single month for 35 years in your retirement account with a 7% rate of annual return, you would have a total of $709,985 at the end of the 35-year period. If you were to start 20 years later saving on the same account, you would need to amp your savings to the tune of $2,200 per month to end up with a similar total balance ($709,985) at the end of the same 35-year period. Last but not least, having no clue about where your money is going is a clear signal that you need help with your finances. Whether you're intentionally or unintentionally refusing to map out your cash flow, you are just hoping that your debt monster will somehow go away. The harsh reality is that it won't and you need a credit counselor to help you figure out the damage — and the solution. What Will a Credit Counselor Do for You? The main objective of a credit counselor is to help you avoid bankruptcy by advising you on a series of financial issues, including money management, debt management, and budgeting. Even in the event that you were planning to file a Chapter 7 or Chapter 13 bankruptcy, you're legally required to obtain credit counseling before filing bankruptcy. A reputable credit counseling agency offers a wide range of services, including budget counseling, savings and debt management education, and debt management plan development. In a DMP, you deposit money every month into an account from a credit counseling agency, which will use the funds to pay your unsecured debts according to an agreed schedule between your creditors and the agency. The U.S. Trustee Program maintains a list of approved credit counseling agencies, providing nonprofit budget and credit counseling services to individuals eligible to file for bankruptcy protection. Depending on the services that you require, the agency may provide them in-person, online, or over the phone. While a credit counseling agency may qualify for nonprofit status, be aware that services may not be free. Here is a useful checklist on how to find the right credit counselor for your unique financial situation. Besides the list from the U.S. Trustee Program, look for additional local candidates with credit counseling agencies affiliated with the National Foundation for Credit Counseling (NFCC) or the Association of Independent Consumer Credit Counseling Agencies (AICCCA). Make sure that the agency is licensed to offer services in your state. To vet agencies for potential consumer complaints, check each one of your choices with the office of your state Attorney General and state consumer protection agency. Also, check for the rating, list of filed complaints, and list of customer reviews of any credit counseling agency with the Better Business Bureau. Requiring a fee for providing information or requesting details about your financial information at this point are two red flags. Also, you should be the one first requesting information, not receiving any unsolicited mailers, calls, or, even worse, spammy emails. Credit counseling should be free or cost nearly nothing. Ask about setup fees and recurring monthly fees. Avoid companies that aren't willing to provide a quote in writing or refuse to help you if you can't pay those fees in full. Reputable credit counseling agencies offer at least some debt and money management workshops or educational materials at no cost. And if you can't afford a credit counselor — meaning, if it isn't basically free — avoid them altogether. Plenty offer free or extremely low-cost services, and the last thing you need is more expenses when you're trying to get out of debt. Look for certifications through external organizations, such as the NFCC or the AICCCA. Credit counselors receiving kickbacks for you signing up for additional services or making contributions to the agency are indications that the counselors won't put your interest before theirs. A DMP is just one of the many services offered by a credit counselor and should only be presented after an extensive review of your financial situation. Avoid agencies that push a DMP from the start. Even when evaluating a DMP, a serious credit counselor would still help you develop better budgeting and money management skills. Any verbal promises that aren't captured on paper are just empty promises. For example, promises from a counselor to lower or eliminate interest, finance, or late fees should be in writing. This will help you in case your creditors indicate that none of those promises actually happened. Also, be wary of agencies pressuring you to sign a contractual agreement right away, particularly when it's a DMP. Take your time to review the document and seek additional help in case you can't understand some of the clauses. Don't sign anything unless you fully understand the contract and are satisfied with its terms.